I live at the very edge of the Volcanic Tablelands in West Chalfant. Sixteen years ago, they scraped most of our acre clean of vegetation, spread decomposed granite and hauled our house in on two trailers! My plan all along had been to plant mostly California natives and other drought-tolerant plants. I brought a few with me from my previous house in Big Pine, and some we got from the old county windbreak program, but that still left a lot of empty space! We were able to purchase some plants locally from Bishop Nursery and Sierra Gardens Nursery (which unfortunately closed several years ago), but I soon realized that much of what I was looking for wasn't even available to our nurseries from the standard wholesalers—they are only available from specialty nurseries. I still shop locally first. During the growing season, I check at least once a week to see what's come into town. Most of the backbone of my yard has come from Bishop Nursery (e.g., mountain mahogany, fernbush, and coffeeberry); I've found Cleveland sage and other star performers at High Country Lumber; and most of our trees came from our own Chalfant Big Trees Nursery. But I'm always searching for something new, and I've never been able to drive past a nursery without stopping, so over the years I have discovered a number of other sources for xeric plants. Today I'd like to share some of those with you. http://theodorepayne.org A non-profit that really works to promote the preservation and use of native plants, Theodore Payne has a retail nursery in a rural setting between I-210 and I-5 near San Fernando. They have a great selection of seeds available online, but if you want plants, you'll have to visit in person. Ten percent discount (15% for members) at their fall, winter and spring sales. https://californianativeplants.com Tree of Life Nursery, on the Ortega Highway between Lake Elsinore and San Clemente, is a fun place to visit in person. Good catalog available online, but no online ordering. https://www.rsabg.org/grow-native-nursery/gnn If you've never been to the Rancho Santa Ana Botanical Garden in Claremont, you're missing out. Spread over 86 acres is the largest selection of our state's native flora to be found anywhere. And their Grow Native Nursery has a nice selection of CA natives for sale to the public. Discounts are available for members (10%) and for individuals working for a public or school garden project (20%). If you're both of those things, you save 25%! https://www.cornflowerfarms.com I've looked many times, but never ordered from this place. They're primarily wholesale, but you can look at their inventory list (email them for login info), choose what you want, and then pick up your order at their nursery near Sacramento. The downside: $200 minimum order. The upside: they have flats of many plants, which is a cheap alternative if you need multiples, say for a ground cover ($2/plant, 25 minimum). A good choice for a group order, maybe? https://plantsofthesouthwest.com My personal favorite for seeds. And if you happen to be in Santa Fe, NM, they have a retail nursery with both seeds and plants that's fun to visit. And while you're there, you could also check out Agua Fria Nursery on the same street, which has lots of 4” pots (my favorite! ), but unfortunately no online ordering. http://www.alplains.com Seeds only, but if you're looking for something obscure this is a good place to look. They also have good germination information for each species. http://www.seedhunt.com Not one I have used a lot, but a fair selection of CA natives and other seeds, including 18 species of Salvia. https://www.dianeseeds.com OK, this one's not really a source for CA natives, but I love their catalog, prices and speedy, friendly service. Some of these I use more for info and dreaming, because shipping is such a killer, but it's cheaper than going and getting it in person! https://www.laspilitas.com A huge catalog and a great resource for learning about CA natives. 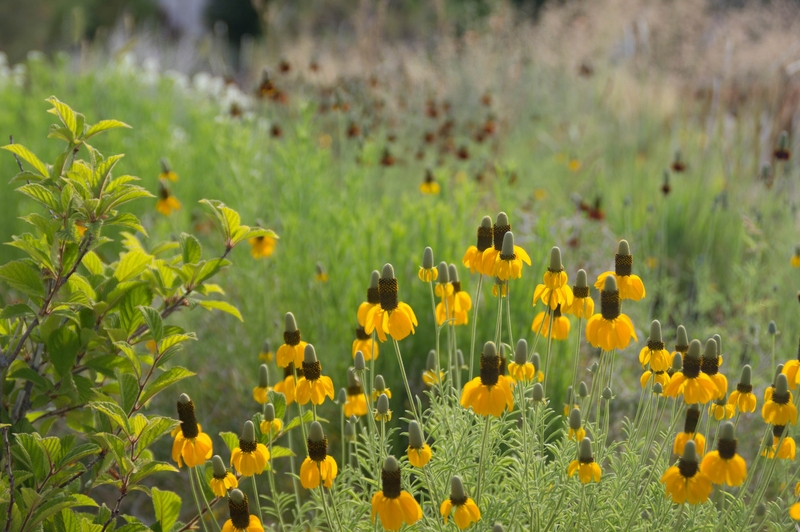 You can visit the nursery in Santa Margarita, which makes for a great spring trip if you combine it with a wildflower expedition to the Carrizo Plains! 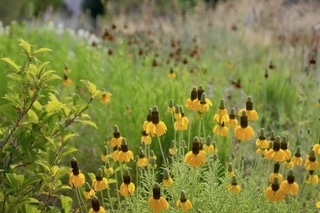 https://www.highcountrygardens.com Another Santa Fe, NM, nursery, and one nearly everybody knows about, with a beautiful catalog of plants adapted for the high and dry West. https://www.mountainvalleygrowers.com The focus of this nursery near Fresno is more on herbs than CA natives, but I always get in on the great deals at their fall sale in September. Their (all organic) plants come in 3” pots and are always beautiful, and their packaging for shipping is by far the best I have encountered anywhere. https://www.fbts.com Again, shipping can be expensive, but if you're looking for a Salvia (and I always am! ), Flowers by the Sea in tiny Elk, CA, is the place to find it. Good catalog with lots of filters and photos, and the plants themselves are reasonably priced. Editor's Note: there can be some restrictions on bringing in plants to California from out-of-state without a certificate. Many nurseries can provide this. Most mail-order sources take care of this for you. Mention of a business is not an endorsement, but only for informational purposes to obtain hard-to-find plants. Last year, I was looking for opportunities to do something unique and satisfying, yet flexible for my work schedule as a Master Gardener. Dustin Blakey, our trusty Farm Advisor, found me the perfect solution, doing a research study on the cultivation of Devil's Claw, Proboscidea parvifolia. Devils Claw is a plant native to the Southwest including the Owens Valley and can be found here and there. The plant has several other names like unicorn plant, double claw, or even red devils' claw. There are several Native American tribes that have used the dry black seed pods in their basketry including those in our area. The Papago tribe ate the pods and the Pima tribe ate the seeds, like pine nuts. So, the plant is diverse – either as a craft or food source. Don't let the resourcefulness end there as it's been rumored to also be used in alternative medicine – things like taking a piece of the broken off claw and pressing it into the flesh and lighting it on fire for rheumatic pain – we definitely don't advise this! There are also species native to the continent of Africa that are used there for ointments, where the tubers and roots are highly valued and sold as supplement. Again this is not research-proven enough for recommendation. Through my research into the plant's growth, I learned that the seeds are highly susceptible to root rot. I did the first planting in early June, well after frost and the spring rains, in a raised bed at the Bishop Community Demonstration Garden. One of the on-going challenges faced was all the "help" with watering. I believe the seeds received too much water and had about a 50% germination rate with the initial planting. Given that rate, I did another planting six weeks later, set up a cover over the watering valve to keep the water off and I saw about an 80% success rate with those seeds. Water was provided weekly with various tests to the schedule, once a week up to once every three weeks. The plants seemed to thrive best with a light watering once a week during the evening, the temperatures during the day were hot and dry. As the plants began to grow, the leaves were large and fur like, with a light gloss to them. The stems were thick and spiny, and both seemed to have viscous goo on them. This is a bit sticky and has a faint odor. 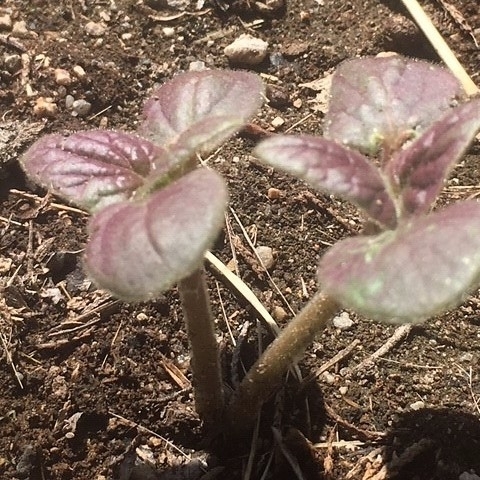 There is just a blush of purple to the stem and leaves. The flowers started to appear mid-August in the high heat of summer. They had white corollas with a violet-red upper lip and a hint of tulip yellow in the center – very similar in design of an orchid, with a graceful white tongue hanging down from a burst of color. As the seed pods started to develop -there was a slow start to their arrival - some were shorter and sharply hooked, while others were a more sweeping arc spinning off a larger firm pod. The pods are edible, supposedly related to the flavor of okra so we began to harvest the green pods before they got too large and tough. I was also growing okra in my plot, because my husband is from Texas. We harvested enough devils claw and okra to do a pickling project. 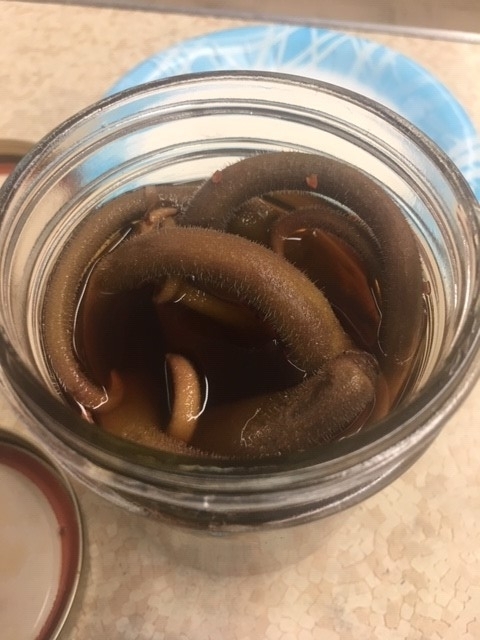 Both were made into refrigerator pickles with the same brine on the same day. They resided in the refrigerator for just over 4 weeks to allow for the brine to do what brines do. Then we proceeded to have a tasting. Visually, the devils claw made the brine turn a dark red color while the okra stayed the same with just a hint of green to it from the fruit flesh. Various brave individuals in the County Services office were recruited to come on down and do a side by side taste comparison. The flavor did have a little similarity to the okra but was much milder and even a tad umami. 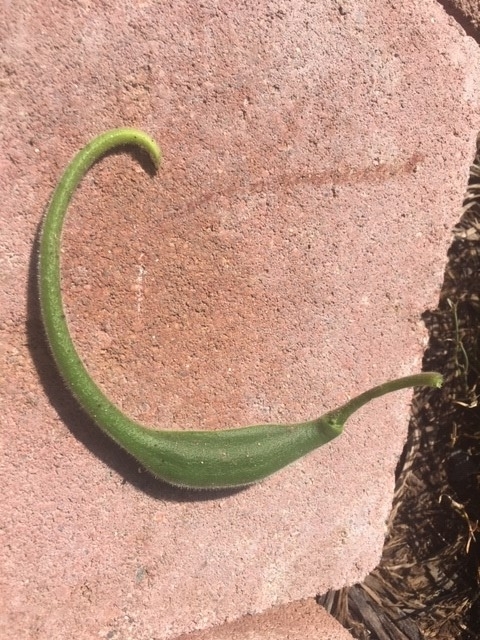 After much head scratching and contemplation by the testers, the devil's claw was agreed upon as a decent food source – some even wondered if the green pods could be used as an okra substitute in gumbo, or deep fried with a cornmeal buttermilk batter. Time will tell next year as to the virtues of devil's claw in capacities other than a pickle since we decided to let the remaining pods dry and split for seed gathering. As the pods dried out, they shed their thick green fur and revealed a black prehistoric-looking shell, complete with T-rex spines, the hooks split in two to allow the access to the seed pod. The harvest of the seeds revealed various seed chambers in the pod and that required some prying and digging to release the bumpy, spiny seeds. The pods are not nearly as delicate as they appear, nor are the hooks. These dried hooks are rumored to be how the plant would spread by merely hooking themselves onto a passing woolly mammoth and dropping off seeds along the way as the pods split apart. The summer is still waning into autumn and the temps are cooler at night and varying cool and warm days. The plants are slowly dying back, and the remaining seed pods are drying up to be harvested for seeds. 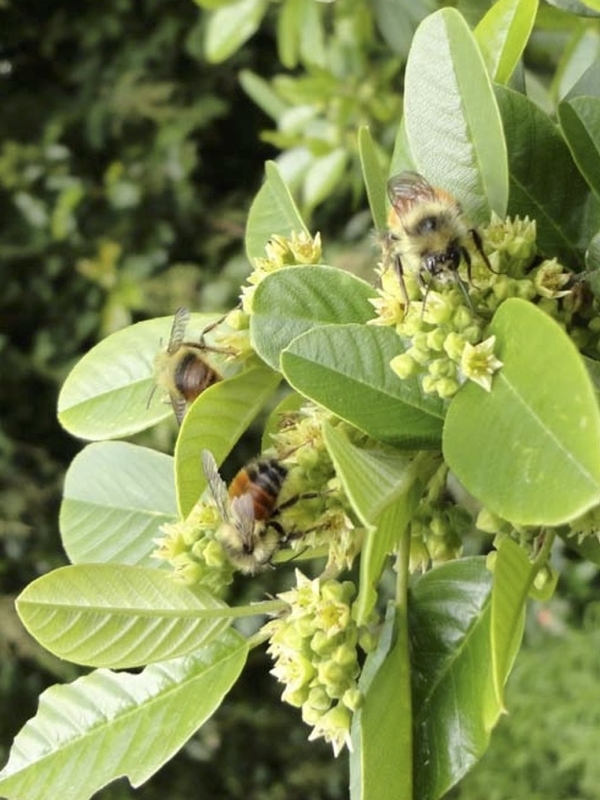 The continuation of this project will be next year when we are able to locate a large planting facility to see how these can be a stable, pest resistant, drought tolerant, multi-use food source. 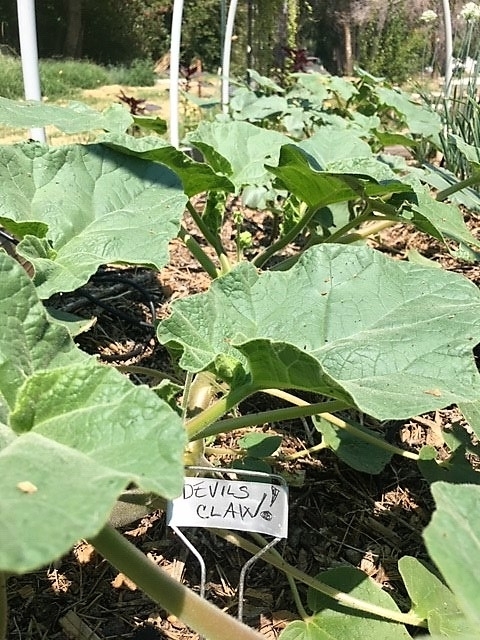 If you have or know of a place to suitable cultivate a larger parcel of devil's claw, please let us know, as we look forward to more culinary adventures with devil's claw, aka unicorn plant. Aggressive—the word has negative connotations, both in everyday life and in the gardening world. But aggressive, along with self-seeder, are words I now look for in plant descriptions. It says to me that they might be tough enough to thrive out here in the wilds of West Chalfant. Of course, one definitely wants to avoid plants that might be invasive—escaping from the garden and spreading outside their native range. Fortunately or not, that's not an issue for me—nothing survives out here without supplemental irrigation! The definitions can be a bit confusing, but maybe naturalized is the word I'm looking for. The USDA defines a naturalized plant as one “that does not need human help to reproduce and maintain itself over time in an area where it is not native,” but that naturalized plants “do not, over time, become native members of the local plant community.” Now doesn't that sound like a plant that any of us would welcome into our garden? The key, of course, is that location, exposure, watering and other variables all affect a plant's behavior. Plants that were obnoxious in west Bishop hardly stand a chance out here. I've tried without success to grow those little violets that used to spread everywhere in my yard. No longer do I have to deal with sprouts from the neighbor's cottonwood tree coming up 30 feet inside my yard. And God has finally delivered me from periwinkle! Now that's not to say that there are no plants that can get out of control in my yard. 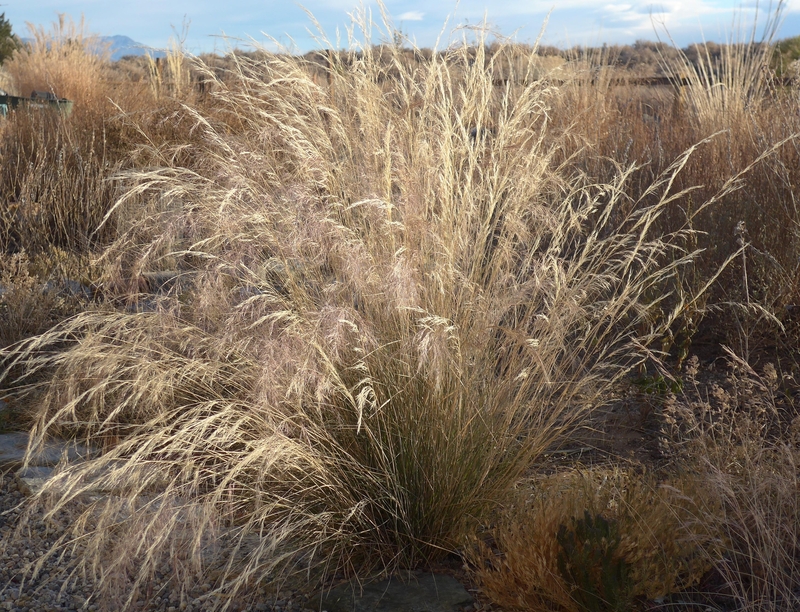 I fell in love with the graceful sway of Mexican feather grass (Nassella tenuissima) when I first moved out here, but soon found out how prolifically they reseed. I now allow only a few plants in inhospitable sites and relentlessly remove any volunteers. Fortunately, the seedlings are easy to pull out. I have replaced the feather grass with purple threeawn (Aristida purpurea), a California native that is easy to grow from seed, super tough, drought tolerant and beautiful all year round. 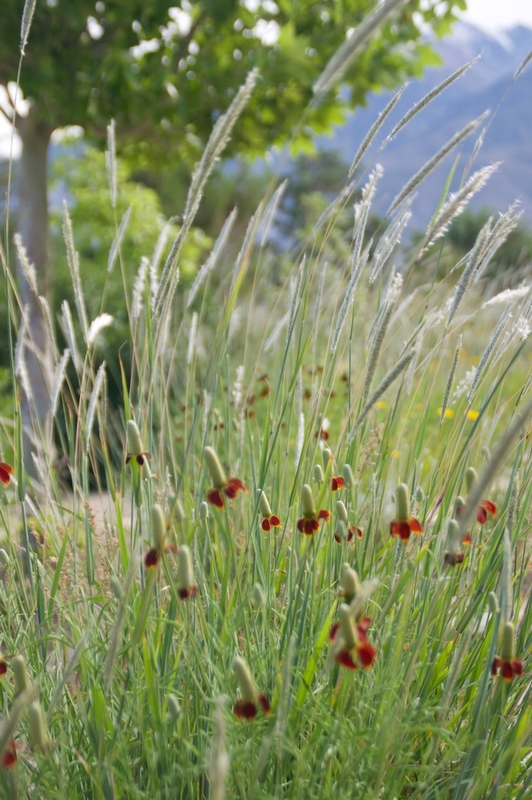 It is a prolific seeder, but not nearly the nuisance that Mexican feather grass is. One caveat is that its seed heads are very poky, so it's unfortunately not a good choice for pet owners. My other go-to grass for tough conditions is silver beardgrass (Bothriochloa laguroides torreyana). This native to the southern half of the US is also easy from seed. One of the prettiest sights in my yard is the setting sun lighting up its white, fluffy seedheads. Like many other grasses, beardgrass has fabulous color during the fall and winter. It's not nearly as drought tolerant as purple threeawn, but it really deserves a place in your garden. 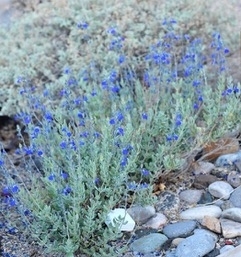 It will reseed prolifically if given abundant water, and though it's a bit harder to remove than purple threeawn, its volunteers survive transplanting much more readily. It constantly amazes me that ornamental grasses are so underutilized in most people's gardens. For more on grasses, see my earlier posts on some of my favorites. I'm always on a quest for yellow daisy-like flowers. Gloriosa daisies and coreopsis were dependable standbys in Bishop, and though I keep trying, they just don't seem to thrive out here. 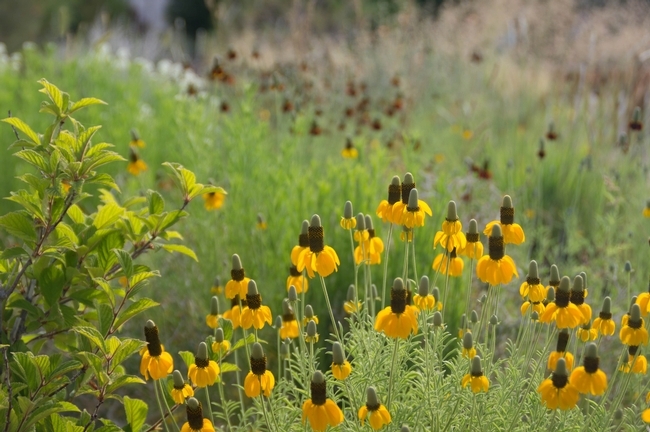 Fortunately, I have found two natives that I can always count on to perform—Mexican hat (Ratibida columnifera) and desert marigold (Baileya multiradiata). 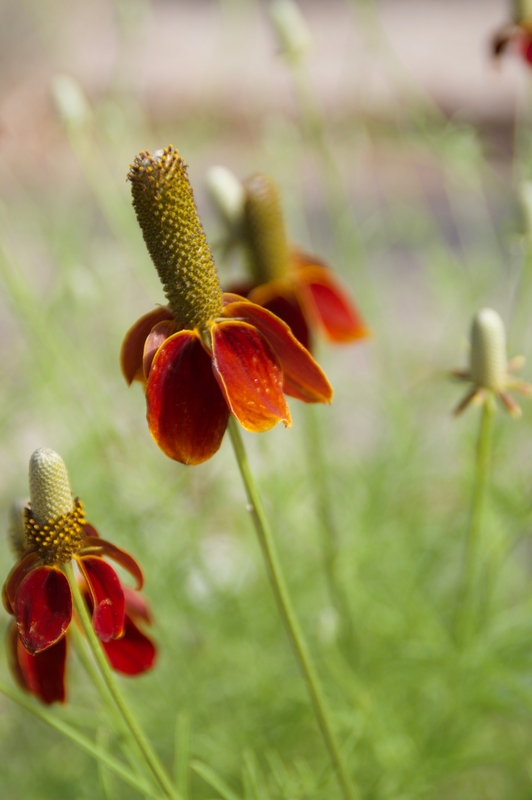 Mexican hat comes to us from the prairies, so though it's drought tolerant, it's also fine with regular watering. It comes in two colors: yellow and red, and if you're growing both you'll get beautiful bi-colored offspring that substitute nicely for the similarly-sized gloriosa daisies. Between the previous year's plants and the new volunteers, they will bloom from late June through September. Desert marigold is found in the desert Southwest, is extremely drought tolerant, and is covered with the cheeriest yellow daisies you could ever hope to find. To keep this little plant (12”) looking neat, I snip off the spent flowers, and Baileya rewards me with a great yellow accent that lasts from May through at least October. Though it's a short-lived perennial, it will readily (but not too readily!) give you seedlings to replace it with. It's happiest with little or no water, so I use it to soften the transitions between watered and unwatered areas. 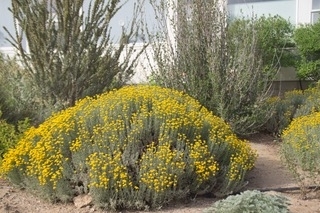 If I have a bare spot in the yard where I want some yellow, I'll transplant in volunteer seedlings of these two plants—Baileya if it's a dry spot, Ratibida if it will get a bit more water. 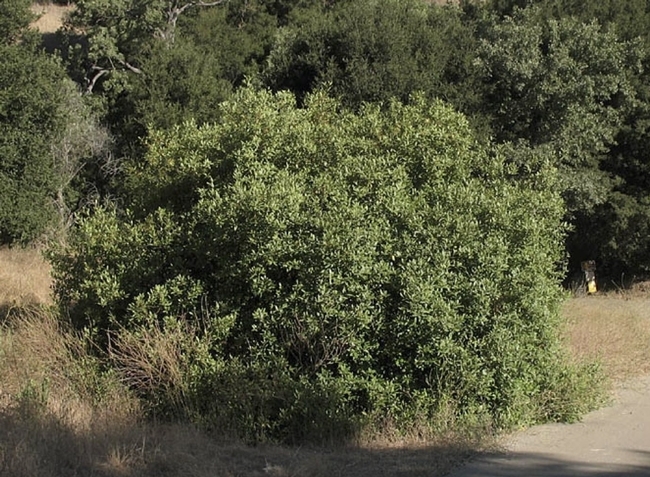 All four of these plants are aggressive—but in a good way. They are easy to grow from seed, they thrive with little care, they look fabulous, and they will give you plenty of volunteers to leave in place or move where you see fit. That is, they are easy to naturalize. You can order seed of all four online from Plants of the Southwest. Colorado Four-O’clock Mirabilis Multiflora - A Striking Native Plant. 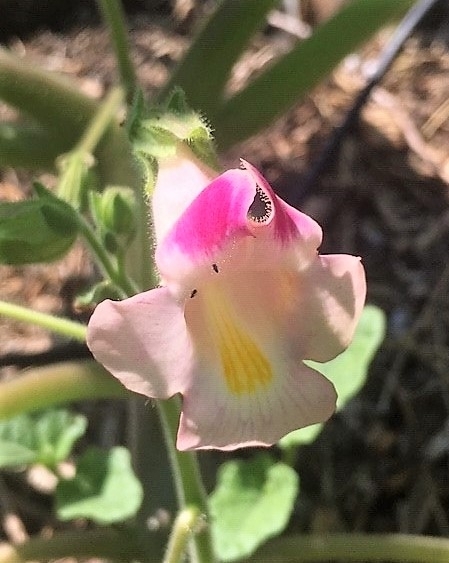 I won't forget the first time I saw Mirabilis multiflora, commonly known as Colorado Four-O'clock, while hiking on the East side of the Owens Valley. I stood there staring at this bush full of bright pink flowers, thinking it looked like a tropical plant plopped down among our stoic sage. Later I read that bougainvillea is in the same family, the Nyctaginaceae family, with many tropical plants. These bright flowers are tubular shaped, with five lobes. They are about one inch across and 1.5 inches long. The leaves are arrow head shaped, the bush growing in a domed mass. The flowers had just started opening that day in the late afternoon, and it's this feature that gives the four-o'clocks their common name. Opening in the late afternoon or evenings, the flowers wither during the next day, with more flowers blooming again in the afternoon. Insects that forage late in the day are particularly attracted to the blooms. The large pink and brown Sphinx moths, that are often mistaken for hummingbirds, are frequent visitors. Hummingbirds also visit the flowers as do native bees and butterflies. 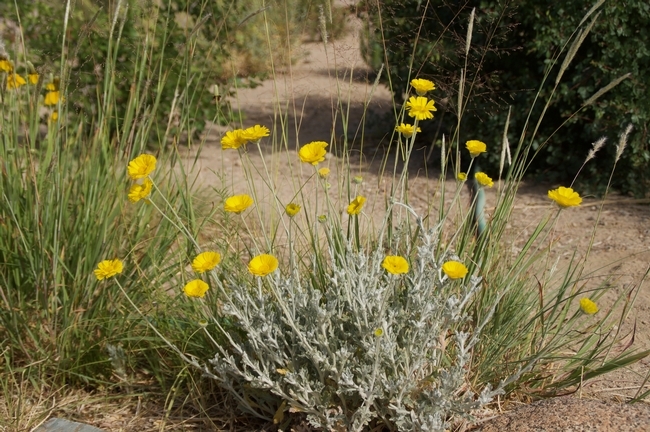 This first Colorado Four-O'clock I saw was blooming out in the open in full sun, growing on a gravelly slope. However, the USDA notes list the light requirements of this plant as partial shade to sun. The notes also state that all native Four-O'clocks in the Western US prefer dry sandy or gravelly soils. Mirabilis multiflora is an herbaceous perennial, growing a large taproot and dying back to the root each winter. 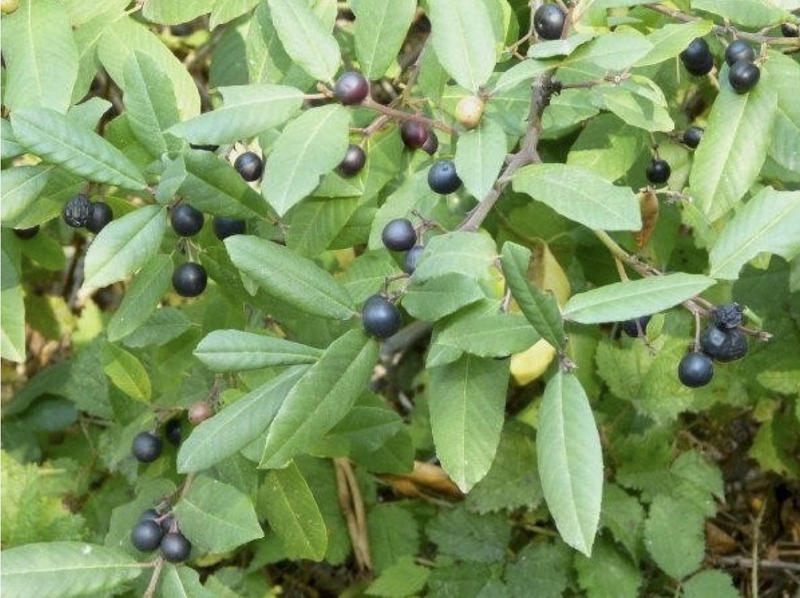 In your garden, it can be cut back in the late fall. A mature plant can get to three feet across and about eighteen inches high. Plant it where it will have room to spread. It is suggested as a good plant for erosion control, and that it looks well spilling over the edge of rock walls, or retaining walls. It should also be a good addition to hot and dry areas of the garden that are a challenge for many plants. When first planted water regularly, but once established the plant will need little supplemental water. 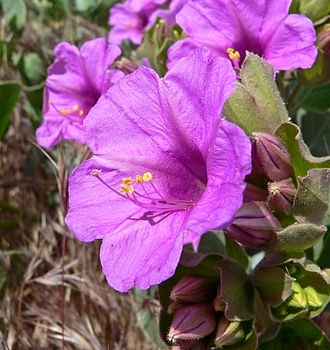 Our local chapter of the California Native Plant Society, the Bristlecone Chapter has listed Mirabilis multiflora on their website as a plant that has sometimes been offered at their annual plant sales. Four-O'clocks more commonly found at nurseries are Mirabilis jalapa, a non-native plant. This plant is also called “Marvel of Peru,” it is a perennial from South America, noted for the flowers' pleasant scent. In colder climates, Marvel of Peru is not reliably hardy. The tap root can be overwintered by digging up and storing in a dark frost free spot and planted up again in the spring. It can also be treated as an annual and let reseed in the garden. Be cautious where you plant either of these Mirabilis species as the seeds have a minor toxicity if eaten, and the roots may cause dermatitis when handled. Consider planting in spots away from play areas. Other common names for Mirabilis multiflora are Desert, Wild, Large or Showy Four-O'clock. It is a very showy and wild looking Four-O'clock. The blooms provide nectar and pollen from dusk to dawn, possibly into the next day, and are a vibrant pink color. This could be a wonderful addition to an area of the garden especially enjoyed in the evenings.